The 2018 Christmas season seems far away as the masses are shopping for Halloween Costumes. 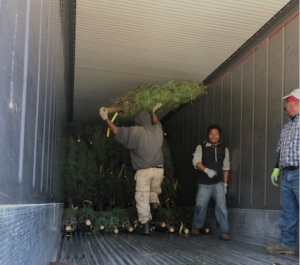 On October 16, 2018 Magellan Transport Logistics shipped the seasons first tree orders from one of the largest tree farms in Oregon. They don’t even have trees for sale yet, however the trees were cut early from their farm and flown by helicopter to the loading yard in Junction City Oregon where Magellan loaded a 40-foot reefer container. The container is going back to the port of Seattle with a final destination of Aruba.